Blended with Rosemary and French Lavender, this shampoo is a natural antioxidant, stimulant and balancer. Highly beneficial for your hair and scalp, and aromatically blended to put you at ease and feel restored. 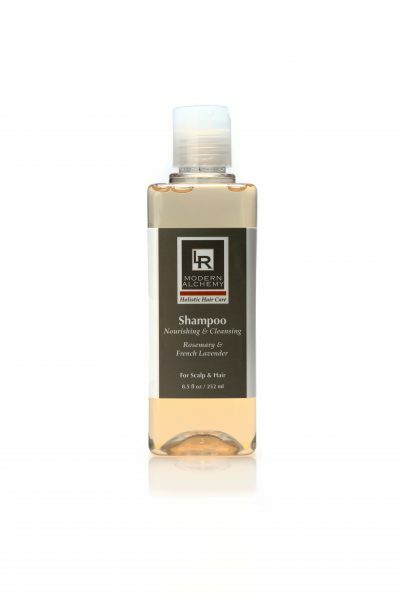 Naturally antiseptic, this shampoo gently cleans your scalp and hair without stripping color, and without drying the hair shaft. We do not use detergents or additives of any kind, and are sulfate free. Our hair products leave your hair supple and luminous. For delicious results, SHAMPOO TWICE. Aloe barbadensis (Aloe Vera Gel), Purified water, Lauryl glucoside (a gentle surfactant made from coconut oil), Coco amidopropl betaine (an organic compound derived from coconut oil), Lauroyl sarcosine (a modified fatty acid), Lauroyl amphoacetate (a mild surfactant), Coco glucoside (derived from renewable raw materials such as coconut oil), Glyceryl oleate (an emulsifier), Sodium hydroxymethyl glycerinate (an antimicrobial agent), and Citric acid. Blended with pure essential oils of Rosmarinus officinalis (Rosemary), Citrus limon (Lemon), and Lavadula angustifolla (Lavender). Rosemary Essential Oil — A powerful and aromatic herb, Rosemary helps circulation and memory and stimulates the lymphatic system. It is known to stimulate hair growth. It is blended here with subtlety for maximum healing. Lemon Essential Oil — Lemon has antiseptic and astringent qualities, and balanced here with Rosemary and Lavender it functions as a middle note, good for lowering blood pressure, providing a synergetic healing for your hair and scalp. Lavender Essential Oil — This versatile plant has been used for centuries, beginning with the Romans and Greeks who used it as incense and in their bathing rituals. Lavender is the most versatile of all the essential oils. It is highly regarded for healthy skin. The fragrance is calming,relaxing and balancing, both physically and emotionally. After two applications, my hair feels cleaner and softer than with any other shampoo I’ve ever used. Have you ever used a Shampoo and feel that your hair needs to be washed the next day ? Well, i must say that the Rosemary & French Lavender Shampoo will give your hair the deep cleansing you need in between washes. Leaving your hair manageable,clean, and with a soft Beautiful light fragrant smell that last between washes. I Absolutely Love this product and cant wait when its time to wash my hair !! !